Well, it looks like the rumors nailed it this time. The HTC One S for T-Mobile will be released on April 25, officially announced the carrier today in a press release. Getting your hands on one will cost you $199 after a $50 mail-in rebate and requires your signature under a 2-year service agreement. The smartphone will be available in select T-Mobile retail stores across the nation, as well as at the carrier's online store. In case you have forgotten, the HTC One S is the middle child in the manufacturer's latest lineup of Android smartphones. It offers a 4.3-inch Super AMOLED display with qHD resolution, and the processor inside it is a mighty dual-core Snapdragon S4 clocked at 1.5GHz. The 8-megapixel camera on the smartphone's back can capture 1080p video and shoot photos with virtually no shutter lag, while the HSPA+ radio peaks at 42Mbps on the downlink. Android 4.0.3 comes out of the box beautified by the Sense 4.0 user interface. Last but not least, all of these goodies are enclosed in a sleek metal body that is under 8 millimeters thick. Anyone thinking of getting this bad boy when it is released? If you are having a hard time deciding, perhaps our HTC One S review might be of help. BELLEVUE, Wash. — April 18, 2012 — Today, T-Mobile USA, Inc. and HTC Corp. announced the highly anticipated HTC One™ S will be available at T-Mobile® stores nationwide on April 25. As HTC’s premier launch partner in the U.S., T-Mobile will be the first to offer the ultra-sleek HTC One S, which is the company’s first device to ship with Android 4.0 (Ice Cream Sandwich) and HTC Sense™ 4. The latest smartphone from T-Mobile to take advantage of 4G (HSPA+ 42) technology on America’s Largest 4G Network,™ the HTC One S provides T-Mobile customers with an amazing camera and authentic sound technology, plus a diverse selection of apps and services that give customers amazing 4G experiences. With the HTC One S, customers will find a fantastic music experience that works seamlessly on T-Mobile’s 4G network. Customers can listen to their music libraries — up to 20,000 songs — straight from the cloud and purchase new music on the go with Google Play. Virtually all audio experiences sound better on the HTC One S thanks to its built-in Beats Audio™ technology, which provides a richer and more authentic sound experience whether consumers are watching movies, listening to music or playing games. Featuring an 8-megapixel back-side illuminated camera and HTC ImageSense,™ which provides a variety of enhancements to the camera’s lens, sensor and software, the HTC One S is always ready to capture pictures in the blink of an eye. Consumers have immediate access to their cameras from their home screens and a super-fast auto focus with continuous shooting to take continuous photos at 4 frames per second simply by holding the shutter button. In addition, the smartphone enables high-quality video recording with a full high-definition (HD) 1080p camcorder and the ability to concurrently capture HD video and still images at the same time. With access to 25 GB of free cloud storage from DropBox, HTC One S customers also can bring their photos, documents and videos virtually anywhere they go and upload new content to the cloud via T-Mobile’s network or Wi-Fi. HTC One S also gives customers a new way to share their content through use of HTC’s wireless Media Link HD accessory. * The small accessory allows easy sharing of any content on the phone with any TV that supports HDMI. Also included with the HTC One S are applications that deliver added value, utility and fun. T-Mobile TV makes it possible to enjoy free or premium live and on-demand programs, from the hottest TV shows to kids’ programs. With the Amazon Mobile application, T-Mobile customers can search and buy millions of products directly from their device and receive special offers on select merchandise. Also highlighted is a T-Mobile-exclusive version of the popular “Where’s My Water?” game from Disney Mobile, with ten levels that can’t be played anywhere else. The ultra-sleek and modern HTC One S will be available in gradient blue and is T-Mobile’s thinnest smartphone (7.95mm). In addition to featuring a beautiful 4.3-inch qHD Super AMOLED screen, the HTC One S is equipped with a 1.5GHz, dual-core Snapdragon S4 processor by Qualcomm® and access to T-Mobile’s fastest 4G (HSPA+ 42) speeds, making the HTC One S a powerful device ideal for customers seeking a fantastic mobile experience. 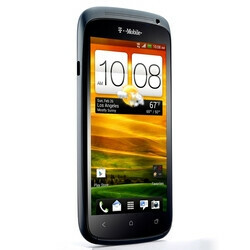 The HTC One S will be available on April 25 at T-Mobile retail stores, select dealers, national retailers and online at http://www.t-mobile.com for $199.99 after a $50 mail-in-rebate card with qualifying two-year agreement. For more information, visit http://www.t-mobile.com/one or http://www.htc.com/us/products/htcones-tmobile. I'm awestruck by the the similar price. How is tmo doing this! HAHAHAHA. I'm definately not going to be using my upgrade on this price. I already have a Sensation 4G so its not like I'm dying to get a new phone. But this price ensures that I'll be sitting on that upgrade for a while.